Royal enfield Desert Storm as the name suggests comes with sand colored paint.The Desert Storm draws inspiration from the World War era, with its bold, macho sand colour scheme. 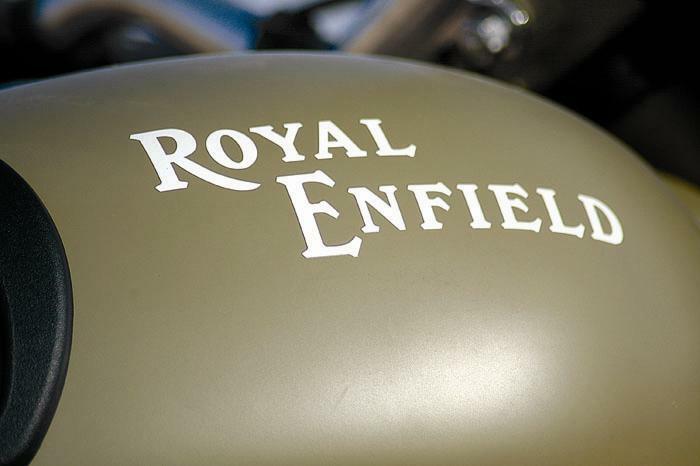 The matt finish paint job, with the Royal Enfield monogram on the tank and the thigh pads, portray the same strength and grit that of a true veteran. The authentic styling features on this ride comprise wide mud guards, an oval tool box, a single spring saddle seat and a unique tail lamp. 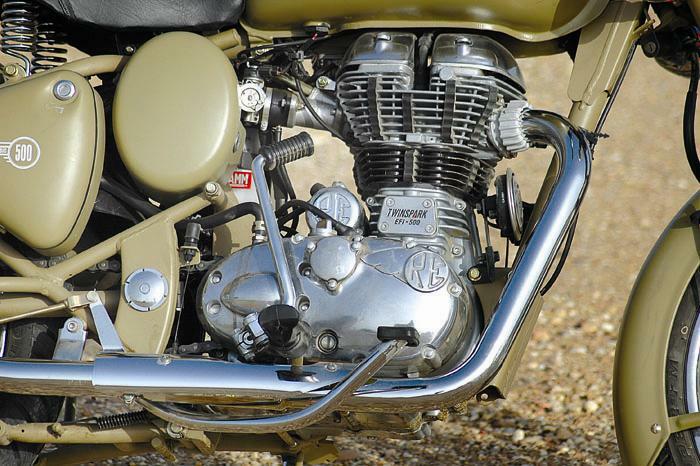 Besides, there’s also the trademark Royal Enfield tiger lamp that further enhances this bike’s appearance. The Royal Enfield Desert Storm 500 is powered by same 500cc single cylinder engine which comes loaded with classic 500 or C5 and the refined engine is added with lots of technological goodies. Its 500cc engine is Unit Construction Engine (UCE) that depends on fuel injection rather than a carburetor. UCE means there is an integrated assembly for gearbox, clutch and the engine, this reduces the friction happening from movable parts and this lowers the transmission losses. To retain its classic look the engine looks borrowed from the post World War II period, but it uses the latest technology. The engine is with electronic fuel injection system that keeps working on to get the best possible mixture of air and fuel depending on ride condition and speed levels. Thus the Royal Enfield Classic 500 is in its best mode at the cruising speed of 100kmph without worrying for fuel efficiency. The Desert storm is based on the same platform as the RE Classic and is also loaded with the same 500cc Twin Spark unit construction engine. The long stroke mill, which is powered by a Japanese-made Keihin Electronic Fuel Injection (EFI) system, can churn out a good 27.2 bhp of power at 5,250 rpm and 41.3 Nm of peak torque at 4,000 rpm. Owing to this, the Classic’s pick-up is really something for a 187 kg bike and it seems like the Enfield can sustain speeds for long durations of time without the engine stuttering or tiring. There is plenty of torque everywhere in the rev range and the plenteous torque is what this motorcycle is all about. The vibes though, make their presence felt at two points of the rev range. The first set is at speeds of around 60kph, where the typical single cylinder resonance tingles your palms. The next is at the top of the rev range at about 120kph, after which the engine smooths down near the top speed. An appealing factor of the Desert Storm is that the throttle response is crisp and gives a Japanese bike feel, all credit to the fuel injection system that brings a modicum of modernity to what is otherwise a retro looking motorcycle. The thump though is subdued by the long Bazooka exhaust. Naturally, the shorter bottle muffler is what will be the first accessory that Desert Storm owners would resort to and that takes care of the all important thump. Handling is always a fun factor on Bullets and the Royal Enfield Desert Storm in India is no exception. New electricals, switchgear, electrical self-start, combined engine and gearbox parts, EFI and even more rigid components like the new front forks, make the new Desert Storm as reliable and refined as any in the segment. 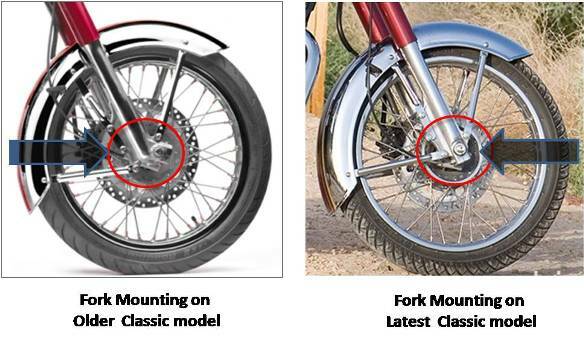 The new front fork suspensions have been modified compared to the older Classic model to improve rigidity and provide more refined handling. The result is that the Desert Storm also offers much better riding comfort and enhanced braking. There is no feeling of pitchy or late reacting brake performance. Minor adjustments to the rake and trail of the front suspension provide comfortable handling especially on bumpy roads. Coming to the key element of the ride, the Desert Storm is clearly the upgraded version of the older classic bearing the spring saddle seats and Bullet fans will love it. Zipping through a traffic bottleneck in the city has been never easy with a big Bullet, but the Classic variants manage to do just that. The gearshifts are smooth, with false neutrals being almost non-existent. As far as fuel efficiency is concerned, the Desert storm returned 38 kmpl in-town runs and 46 kmpl on the highways riding at 60 kmph. A 42 kmpl overall mark is terrific by any stretch of the imagination but this is the real world we are talking of and it equates to a 567 km range using the bike's 13.5-litre petrol tank. 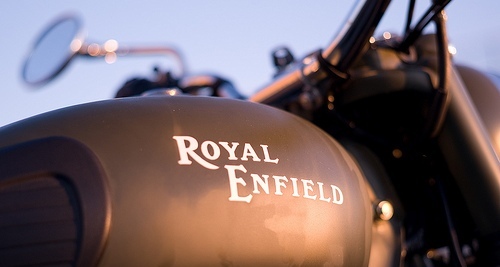 Royal Enfield Desert storm 500 price in India settles at Rs 1.58-1.65 lakh (ex-showroom, Mumbai). It’s the best set of wheels you can get after paying for that price tag, total valve for money.